Hi friends! Today I'm sharing a fun Project Life Challenge - who's in!? 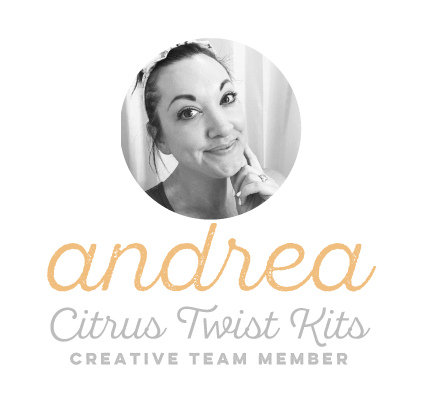 I actually have 2 challenges that you can use in any project! 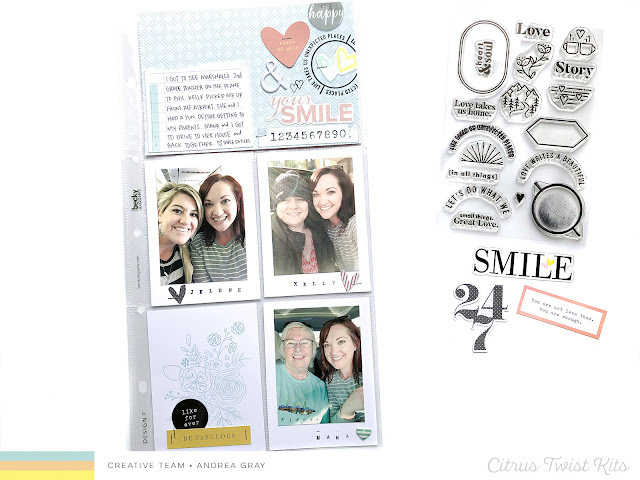 The first is: embellishment collage! The pocket below shows how I combined stamps, acetate, die cuts, and puffy stickers to make an eye-catching title card. I love making these - it's like a puzzle of pretty supplies. Use this technique on your next project and you'll also find that you can use so many of your favorite pieces together!! The second challenge is to use a consistent style for your photos cards. This may work best for a themed or special event that you're adding to your pockets, weekly PL may not work too well but I know I'm going to give it a try. The idea is to make them all feel similar and that one doesn't stand on its own. I wanted to document all of the girls I got to see in person on this one day. I sized the photos down to smaller than 3x4. I trimmed off a bit more from the bottom to leave room on the back paper. Then I matted them like Polaroids on 3x4 cardstock. The consistent style here is that I stamped the name and added a heart. That's it! 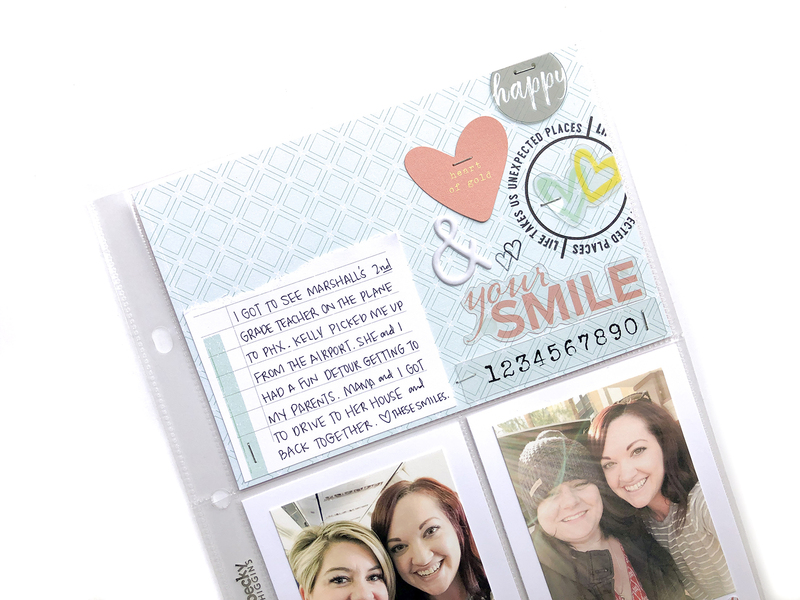 You can do this with a date stamp, a sentiment, or even word strips. Besides the look of clean and consistent, it was FAST! Having a formula and not having to figure out something different to do on each card made this page super easy! Thanks for being here, friends! 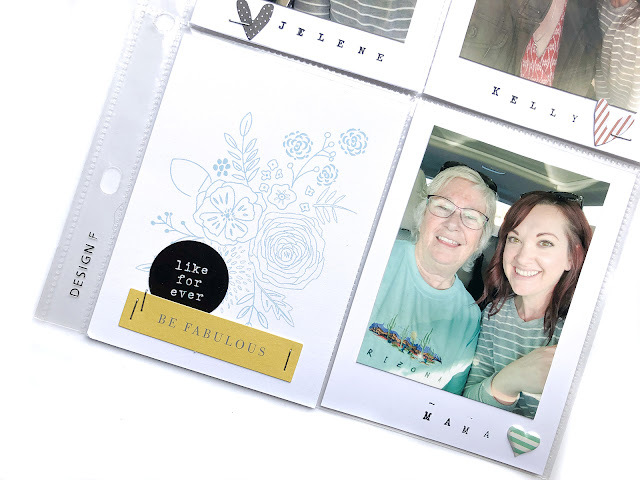 I hope you're inspired to try a new thing in your pocket page album! Any guess at about what size you trimmed your pictures to?